My wife asked me to help her set up a food blog. I found a great recipe plugin and theme and implemented small customisations with clever use of code. My wife, Caitriona, likes to cook and is always searching for new dinner recipes that she then tweaks. Friends and family often ask her for her recipes so she decided to start a food blog to store them. As her web site developer husband she came to me to help set up the site. I did a bit of research and found a recipe plugin and a nice Genesis based theme. 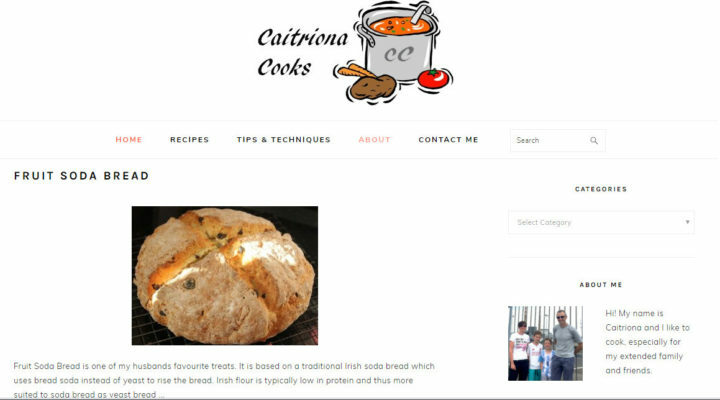 I set up the site and she began adding recipes. I took most of the photos of the finished dishes. And I got well fed too! My wife and youngest son looked through free clipart sites and picked out the logo. I added the ‘Caitriona Cooks’ text and the ‘CC’ to the saucepan. I didn’t have too much customisation to do though the home page has a subtle but significant difference – it now has pagination where you can easily view older posts. The default home page uses a widget to show recent posts. You can set the number of posts, whether the title, some content and an image is shown. Unfortunately there is no link to go to the older posts. Caitriona asked me to change this. I examined the code for the widget and copied some of it and then used built-in features of the underlying Genesis framework theme. She also wanted the home page to use Previous/Next navigation but wanted numeric navigation (1, 2, 3 etc) on other pages. As the theme settings were one or the other (we set it to ‘numeric’) I had to limit the display of Prev/Next to the home page. Because of how the Genesis framework theme works I only had to write a tiny bit of code – it was mostly changing the Genesis functions that were called.